The following article is dedicated to functional office outfit ideas complemented with a pencil skirt. This ladylike piece of clothing will help you to get down to business. I know, sometimes you find yourself in a ridiculous situation, as you have nothing to wear. Trust me, you can still find something cute and ladylike. You can invest in a beautiful pencil skirt. This versatile essential can be easily dressed up in different cool ways. Why do I like this skirt so much? It hugs woman’s curves and creates a beautiful, ladylike silhouette. By the way, the same skirt can be worn to different occasions, starting from the office to cocktail parties. Go bold with a rich red blazer, the same color pencil skirt, and blush lace top. 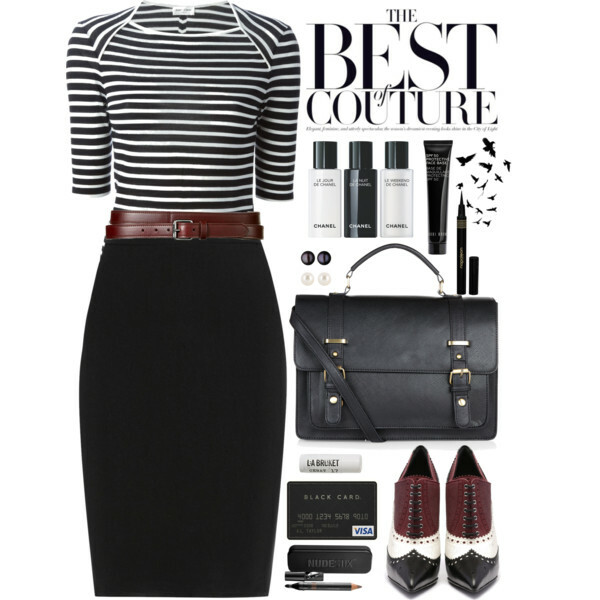 Complete this stunning outfit with a dark cherry handbag and glossy blush pumps. Once you decided to wear this garment, then you definitely want to know what to wear with a pencil skirt. If you want to create a formal or semi-formal look, then the first top you should definitely try is a dress shirt. I recommend starting from neutral solid color version. Yes, the result might look too much simple, but you can always add some extra accessories or even jewelry. You can also create a stunning white-and-black look. This will catch some eyes though. If you want to make a wow impression, then you can add a cute blouse. It will definitely do the trick! Pencil skirts flatter absolutely every body type, no matter if you are skinny or fatty. My personal favorites are neutral colored skirts, they are perfect ones for a daytime wear, all you need is to add a lovely blouse to define your waist and a fitted blazer to make things look more professional. A black pencil skirt is a nice choice for women who are always late for work. Why? They can be easily paired with almost any top or shirt. Keep your silhouette simple and classy. There are tons of cool ideas how to transform this beautiful clothing staple from a plain librarian look into professional and feminine must-have! In other words, this is an important wardrobe essential for office hours.